Carnitas Street Tacos with Paleo Taco Shells Rock’d out Our Late Night Pig Roast Hawai’ian Imu style. What a blast we did our 2nd Annual Hoffman Lu’au or Pig Roast Pit Fest!! A gathering that takes some preparation for sure…from pit digging, pig injecting, banana leaf wrapping with burlap and chicken wire!?! Yeah it gets interesting for sure!! This year we used our Own Hoffman Grown Finnish Heritage Pig for the feast. I just love cooking for people and this party was such a great way to have a big celebration! My husband Aaron invited a big crew of guys from Nike Headquarters and these Carpenter Union boys work hard and play hard. A Couple guys, Aaron being one, had so much fun they even bruised ribs on the Ultimate slip and slide! I am also Blessed to share this time with the gals from the office. Little Davi certainly knows how to rally on the Slip and Slide! We love our crews at work – they are our family – and what a hit to bring us all together. Food will do that when done in these old slow food ways! I’m so excited to say this is a tradition for us and now I can’t wait til next year …cuz I’m soooo doing these recipes again! 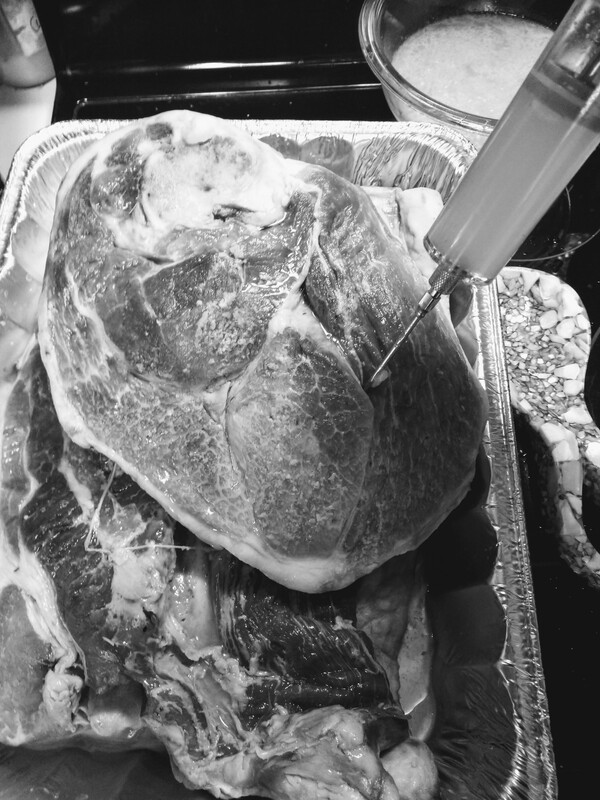 So the Doc got to inject meat….and it was way easier and healthier than using fillers. HA! I blended Real Salt with pineapple, apple juice and butter and injected the liquid into the muscle and tendon junctions of the meat for the 12 hour pit roast. The result was amazing. Nothing beats eating pork right from the pit, and then the late night Street Tacos were a big hit!! Let me tell you Tiffany’s Plantain Taco Shell and Pork Carnitas recipes are divine. They are so easy you can do them for your July fourth meal or a 2 day party! These Plantain Taco Shells are delicious soft or crispy. Enjoy them with your filling of choice or my Crispy Carnitas filling found in the Empowered by Real Food Cookbook. 4 TBSP Oil Avocado, olive, or lard etc. scrap down the sides, and blend again. create round tortilla circles about 4 inches wide and 1/8 inch think. until firm. Keep a close eye on them to prevent burning. Feature Photo by Cookbook Creator Andrea Wycoff, staged by Creator Tiffany Previti of The Urban Paleo Homestead. Int features the tacos filled with Tiffany’s Pork Carnitas for Street Tacos (recipe included in the Empowered by Real Food Cookbook), or fill tacos with season ground beef. Photo includes a side of shredded red cabbage wilted with sea salt, lime juice, and a little honey.